The lighthouse sits atop the Lighthouse Inn inside Nantucket Sound at the mouth of the Bass River in West Dennis. 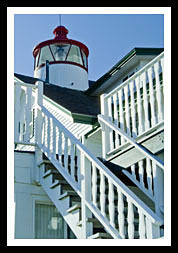 The Lighthouse Inn is open year round and lighthouse tours are offered during the summer at specific times. It is off School Street from Route 28. The area’s whaling, shipping, and commercial fishing traffic was increasing, causing the need for a lighthouse to be built on inland waterways like the Bass River. Before a lighthouse was constructed, a local resident, Warren Cromwell, kept a lantern burning in the attic window of his house to help guide mariners along the Bass River. Ship captains who would use the service would pay Cromwell twenty-five cents a month so he could purchase the whale oil needed to keep the lamp burning. When Bass River Lighthouse was finally constructed in 1854, he became its first Keeper. Cromwell remained at the lighthouse until he was called to serve in the Civil War, where he was wounded and captured in Virginia. He survived through the war and returned to become Keeper of the lighthouse again until 1880. In 1914 the light was extinguished with the building of Cape Cod Canal. 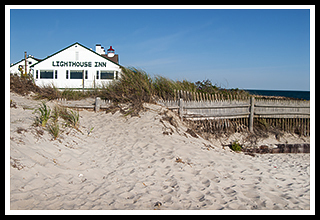 In 1938, the property was bought privately and frequently would have overnight guests at the lighthouse, becoming what is known today as the Lighthouse Inn. During World War II American planes would bomb the rocks near the Lighthouse Inn for practice, which became quite an attraction for those guests that were staying over. In celebration of the Lighthouse Service’s 200th anniversary, Bass River Lighthouse was relit in 1989 and continues as an aid to mariners today. The lighthouse is now part of the Lighthouse Inn. The Inn and lighthouse are open for occasional tours in the summer season, and visitors can stay at the Inn all year round. There is a summer educational program for kids at the lighthouse. The area is quite busy with tourists during the summer season with plenty of activities to enjoy. The towns of West Dennis and Dennis offer nightlife, beaches, the Cape Cod Rail Trail, among many trails, for miles of biking and hiking, golfing, fishing excursions, and nightlife. The Cape Cod Rail Trail is a paved trail for bikers and hikers that starts in Dennis and follows old railroad lines through Harwich, Brewster, Orleans, Eastham and Wellfleet. As an ecological experience, through these six towns you'll pass through forests, fields, marshland and cranberry bogs. To get one of the best views of the surrounding cape area, climb atop the 160 foot Scargo Hill with its 28 foot observation tower in Dennis, as it looks across Cape Cod Bay, offering a panoramic view from Provincetown to Boston. From Route 28 in West Dennis just east of Bass River, turn south on School Street to Lighthouse Road. From Lighthouse Road turn left onto Lighthouse Inn Road. 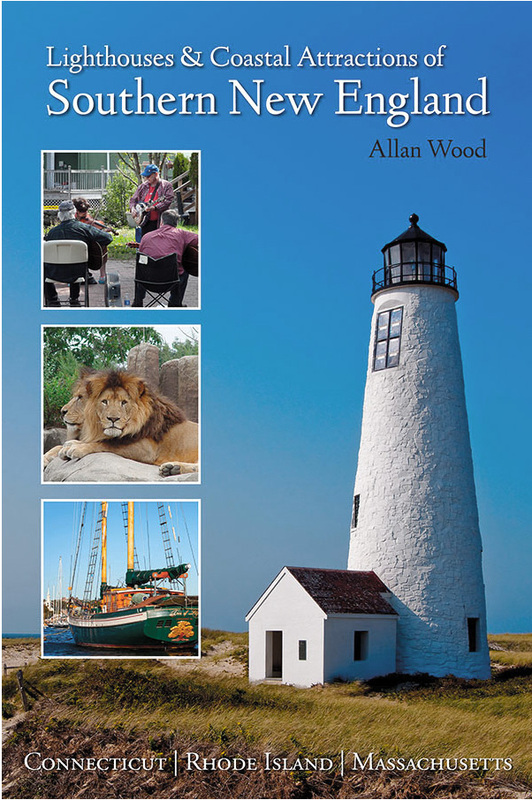 My new book, Lighthouses and Coastal Attractions of Southern New England: Connecticut, Rhode Island, and Massachusetts, published by Schiffer Publishing, provides lots of special human interest stories from each of the 92 lighthouses, along with plenty of additional indoor and outdoor coastal attractions and tours in the area, with contact info to plan your trip. I'll be happy to sign it for you here, or you'll find it in any fine bookstore.